Many small businesses choose to offer IRA Plans to their employees to help with their retirement savings. Employers can choose to contribute a set amount, which is usually a percentage of an employee’s income. Or, employers can choose to match the amount the employee contributes, up to a certain amount or percentage. Your employees will manage their funds independently, and choose how they want to invest. We will explain the differences between the types of accounts, and may even be able to offer your employees several options. 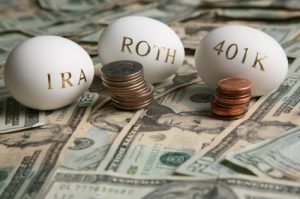 401k plans are usually offered by larger companies because they require more management than an IRA plan. Unlike an IRA, the employer manages the investment. Employees are able to choose from several investment options, but these options are limited. The upside for your employees is it’s less work and less stress for them. The benefit for you is that you don’t have to worry about different employees having different types of accounts, different investment advisors, or different banks handling their retirement savings. Whichever type of retirement accounts you offer your employees, we offer investment planning and management services for both individuals and businesses. We’ll help create a customized portfolio for you or your business, manage your investments, and provide regular reports and recommendations. A Certified Financial Planner will handle your accounts, so you can be sure you’re getting sound advice to help your money grow and reach your retirement investment goals. Learn more. Fees are hourly or service-specific depending on the nature of the work. Estimates are provided in advance of work performed.